You are about to experience one of the most unique turn-based RPGs of your life! Set off on a journey of survival, honor, and epic battles to to restore your guild to its ultimate glory. 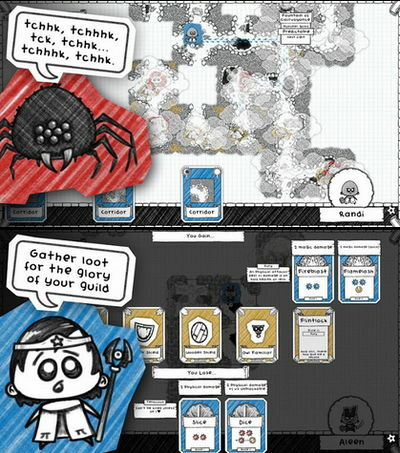 Guild of Dungeoneering is full of epic quests to quench your hunger. Recruit the most powerful heroes, explore the dungeons, build your deck and fight various enemies, manage your guild, build new rooms, and much more. thsi game is a turn-based RPG with a twist: instead of controlling the hero, you build the dungeon around him. Using cards drawn from your Guild decks, you lay down rooms, monsters, traps and of course loot! Meanwhile your hero is making his own decisions on where to go and what to fight. Enjoy beautiful pen & paper visuals and funny dialogues as you lead your heroes to victory. 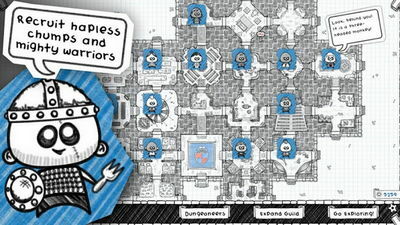 Guild of Dungeoneering let you entice, coax and bribe your heroes to clear the dungeons you build by strategically placing rooms, monsters and loot from the cards you are dealt. Improve your guild as you level up and unlock more rooms and equipment, and have fun! Install Apk, Copy OBB folder ‘air.com.gambrinous.guildofdungeoneering’ to sdcard/Android/obb , and launch the game to play.